In this episode Jonathan and Eric look at the possible effects of Brexit. They talk about practical steps organisations may want to work on now to make sure they are ready if the UK and EU don’t reach agreement prior to the end of the initial transition period in March 2019. 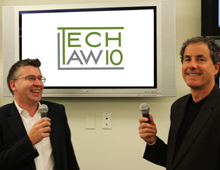 TechLaw10 is a 10-minute audio podcast update from U.S. lawyer Eric Sinrod (Duane Morris) and UK lawyer Jonathan Armstrong (Cordery) where they share insights on developments where technology intersects with the law in the EU and the U.S. These well-known commentators are sought out in the media for their opinions on breaking news and developing trends. Whether you are in North America or Europe, now you can hear directly from them regarding the latest technology issues at home and across the pond.